Mark Twain once defined playing golf as a ‘good walk spoiled’, yet for psychologists the Ryder Cup between the USA and Europe is worth watching because of the many different elements of psychology at play. From the idea of home advantage through to the stress of competition, psychological factors play an obvious and important role. How might group processes affect team performance? When and how does stress impact particularly on golfers? And what about the fans who will follow the tournament, especially supporters of either team – what emotional and psychological experiences might be in store for them? The Ryder Cup is a biennial golf tournament in which two teams of male golfers from Europe and the United States compete over three days for the 17-inch high solid gold Ryder Trophy. (The Solheim Cup is the equivalent tournament for women and will be held in September 2011). In the Ryder Cup 24 golfers, each of them wealthy individuals, will compete without payment over three days in golf’s most prestigious team event. What psychological factors will be at play both for players and supporters when the 38th Ryder Cup begins on 1 October? Although all team prizes in golf at the time of writing are held by the United States, the European team will likely feel confident of victory as the Ryder Cup is being held in Newport, Wales. Sports teams typically perform better at home and a glance at the Ryder Cup results since 1979 when the competition took its present form of Europe (rather than GB and Ireland) against the USA shows that the home team has won nine of the 15 competitions (60 per cent), with the away team winning five and one draw. This is in line with percentages in other sports. Although the pressure induced by team-mates can be onerous, golfers in team events often cite functioning effectively as a team to be one reason why they succeeded. The Ryder Cup is an example of a coactive team sport where players perform the skills individually but it is the collective performance of the team that determines success. In this regard the cohesion of a team is important. There is a positive relationship between cohesion and performance, even for coactive teams. Both task cohesion and social cohesion are positively associated with performance, so in sport it is as beneficial to have a commitment to develop and maintain social relationships within the group as it is to be committed to the various task objectives of the group (Carron et al., 2002). Because of the importance of cohesion for success, sport psychologists utilise a number of interventions to enhance cohesion. Some are focused on enhancing social cohesion (e.g. a mutual-sharing session) while others are focused on enhancing task cohesion (e.g. team goal-setting session). In individual sports like golf, team building interventions are particularly effective in enhancing cohesion as players rarely compete as a team (Martin et al., 2009). 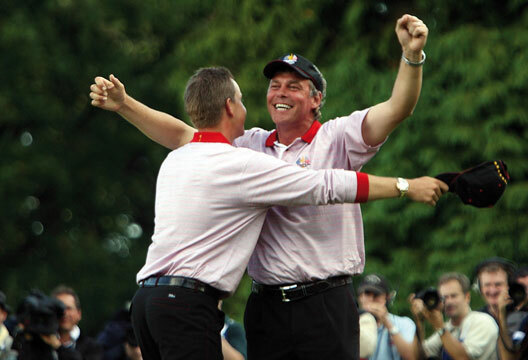 The structure of the Ryder Cup means a range of psychological demands on the players. On the first two days of competition the golfers compete in pairs, and in each match two players from the USA take on two players from Europe, whereas players compete individually against an opponent on the final day. In the first two days of competing in pairs players compete in ‘four-ball’ matches, where all four golfers play their own ball and each hole is won by the team whose individual golfer has the lowest score, and ‘foursomes’ in which each pair of golfers plays one ball and each hole is won by the pair with the lowest score. In both team events players will have to work together effectively. For example in the ‘four-ball’ one golfer may play conservatively to allow his team-mate to play more risky shots, while in the ‘foursomes’ format players will take alternate shots and the golfers will have to interact to agree on the best tactics for each hole. In both these types of match, and the final-day singles, the way in which team-mates and opponents interact may influence performance. Emotions can be contagious among team-mates (Totterdell, 2000), and emotions that help or hinder performance could be transmitted between players. In addition, maintaining positive body language (e.g. erect posture, plenty of eye contact) has been shown to reduce how confident an opponent feels about doing well in a sport setting (Greenlees et al., 2005). The colour of clothing may also be important, and red in particular appears to be associated with success in sport. Red is proposed to have evolutionary significance as a sign of dominance and threat, and wearers of red in competitive sport are more likely to be successful than wearers of other colours (Hill & Barton, 2005) and to be perceived by opponents (Greenlees et al., 2008) and officials (Hagemann et al., 2008) as more likely to succeed. Interestingly, Tiger Woods is famous for wearing red in the final round of every major tournament. Although golf, particularly outside team events, is typically considered an individual sport, this is a misconception. Golfers, at a professional level, do not compete alone. Although the golfer is the one who executes each golf shot, a caddie will be with the player throughout the tournament carrying the golf bag and working with the golfer on the course, often discussing strategy and technique. Many caddies also spend time with their players before and after a competition during warm-up and post-round practice sessions, often playing a role of monitoring and controlling the golfer’s psychological state during competition. The golfer and caddie work together more effectively with increasing familiarity, although this can sometimes lead to an over-reliance by the golfer on the caddie such that the golfer does not take an active role in decision making (Lavallee et al. 2004). When anxious, athletes’ cognitive resources available for a task may be reduced, because of worry (Janelle, 2002) and attention directed to task-irrelevant stimuli (Eysenck et al., 2007). However,if an individual is at least moderately confident of success, performance can be maintained even under high anxiety because an individual allocates extra mental resources to the task (Eysenck& Calvo, 1992). These techniques are not only used before competition and during breaks in play but are frequently combined, along with behaviours (e.g. waggling the club head a set number of times) into pre-performance routines to be used as the golfer prepares to strike the ball (see Cotterill, 2008, for a review). The aim of a pre-performance routine is to prepare the golfer psychologically and physically for the shot and ensure a consistent (and excellent) standard of performance. Regulating psychological responses draws on, and depletes, a limited pool of resources that is available for controlling all emotions, thoughts and behaviours (Baumeister et al., 1994). Depletion of this self-regulation strength in one area affects performance in another area. For example, the effect of depletion from a cognitive task (Stroop task), negatively affected performance on a muscular strength task (Bray et al., 2008). So being able to regulate psychological responses with as few resources as possible (i.e. by perceiving the situation as a challenge) is helpful because it leaves sufficient self-regulatory resources for other demands (psychological or physical) that may subsequently arise in the competition. One framework for understanding how athletes may respond and perform in an important competition is the ‘theory of challenge and threat states in athletes’ (Jones et al., 2009). According to the theory a golfer will experience a challenge state with high self-efficacy, a perception of control and a focus on approach goals. By perceiving the competition as a challenge rather than a threat, the golfer will have less cause to regulate their responses to competition. In short, prevention, in terms of perceiving the event positively so there is less cause to regulate unwanted psychological responses, may be better than cure. One area where psychological factors may play a particularly important role is on the green. The old adage ‘drive for show, putt for dough’ illustrates the importance of putting to successful golf performance. Indeed putting is one of the strongest predictors of golfers’ overall score (Hellstrom, 2009). Not only does putting test a golfer’s ability to cope with pressure, it is also reflects a cognitively demanding task. Because golf greens are rarely flat, a golfer is required to ‘read’ the green to determine the ‘break’ (the change in speed and direction of the ball) as it rolls towards the hole. This is a crucial skill and expert–novice differences in visual search patterns have been detected when reading a virtual (3-D) green. Expert golfers display longer visual fixation duration on the ball just before and as the stroke is performed (i.e. the quiet-eye phenomenon: Vickers, 2007), suggesting they display distinctively different periods of visual cognitive activity during the planning of a putt (Campbell & Moran, 2006). Expert golfers also benefit more than novice golfers from imaging a successful putt as quickly as possible before striking the ball (Beilock & Gonso, 2008). Taking longer to imagine the putt does not help expert golfers as it allows the golfer greater opportunity to focus on the mechanics of the putt. Sporting events like the Ryder Cup are clearly important for those taking part but they are also important for those watching who identify with the teams involved. People derive part of their self-concept from the social groups and categories to which they belong (Hogg & Reid, 2006). This social identity is part of ‘who we are’ and contributes, along with our individual attributes to how we see ourselves. We are motivated to maintain a positive social identity and do so by ensuring a favourable comparison with other groups. In the case of the Ryder Cup we have a continent and a superpower competing in a sporting arena. For those supporters who identify strongly with the teams involved, the event will not only be an emotional experience but may also have a substantial influence on well-being. While no data has been collected on golf team events there is a large body of research from other sports. Supporters of losing football teams typically report higher levels of negative emotions and lower levels of positive emotions than fans of successful teams (Kerr et al., 2005), and testosterone levels increased in the fans of winning basketball and soccer teams and decreased in the fans of losing teams similar to that which would be expected in the actual competitors (Bernhardt et al., 1998). More seriously, football game outcome has been shown to influence myocardial health negatively in losing fans (Carroll et al., 2002), and positively in winning fans (Berthier & Boulay, 2003). Clinically significant levels of distress have been observed in fans of teams who have been relegated from the English Premier League (Banyard & Shevlin, 2001). While we do not know whether supporters will identify with the Ryder Cup teams in the same way they would local or national teams that compete frequently, it is possible that those watching and supporting will experience similar emotional and physiological changes to those taking part, and the outcome of the competition may influence the well-being of many people in Europe and the United States. Your authors at least, as a European and American respectively, we will experience the full range of responses by the evening of 3 October. Banyard, P. & Shevlin, M. (2001). Responses of football fans to relegation of their team from the English Premier League: PTS? Irish Journal of Psychological Medicine, 18, 66–67.Baumeister, R.F., Heatherton, T.F. & Tice, D.M. (1994). Losing control: How and why people fail at self-regulation. San Diego, CA: Academic Press.Beilock, S.L. & Carr, T.H. (2001). On the fragility of skilled performance. Journal of Experimental Psychology: General, 130, 701–725.Beilock, S. & Gonso, S. (2008). Putting in the mind versus putting on the green. Quarterly Journal of Experimental Psychology, 61, 920–932. Bernhardt, P.C., Dabbs Jr, J.M., Fielden, J.A. & Lutter, C.D. (1998). Testosterone changes during vicarious experiences of winning and losing among fans at sporting events. Physiology and Behavior, 65, 59–62. Berthier, F. & Boulay, F. (2003). Lower myocardial infarction mortality in French men the day France won the 1998 World Cup of football. Heart, 89, 555–556. Bray, S.R., Martin Ginis, K.A., Hicks, A.L. & Woodgate, J. (2008). Effects of self-regulatory strength depletion on muscular performance and EMG activation. Psychophysiology, 45, 337–343. Bruce, D. (1998). Turn up, keep up, and shut up: The role of a caddie in male professional golf in Australia. Unpublished master’s thesis, University of Queensland, Brisbane. Butler, J.L. & Baumeister, R.F. (1998). The trouble with friendly faces: Skilled performance with a supportive audience. Journal of Personality and Social Psychology, 75, 1213–1230. Campbell, M. & Moran, A. (2006). Exploring golfers' visual ability to 'read' slope of greens. Paper presented at the 37th Annual Conference of The Psychological Society of Ireland, Galway. Carroll, D., Ebrahim, S., Tilling, K. et al. (2002). Admissions for myocardial infarction and World Cup football: Database survey. British Medical Journal, 325, 1439–1442. Carron, A.V., Colman, M.M., Wheeler, J. & Stevens, D. (2002). Cohesion and performance in sport: A meta-analysis. Journal of Sport & Exercise Psychology, 24, 168–188. Carron, A.V., Loughhead, T.M. & Bray, S.R. (2005). The home advantage in sport competitions: Courneya and Carron’s (1992) conceptual framework a decade later. Journal of Sports Sciences, 23, 395–407. Cotterill, S. (2008). Developing effective pre-performance routines in golf. Sport and Exercise Psychology Review, 4, 10–15. Eysenck, M.W., Derakshan, N., Santos, R. & Calvo, M.G. (2007). Anxiety and cognitive performance: Attentional control theory. Emotion, 7, 336–353. Greenlees, I., Buscombe, R., Thelwell, R.C. et al. (2005). Impact of opponents’ clothing and body language on impression formation and outcome expectations. Journal of Sport & Exercise Psychology, 27, 39–52. Greenlees, I.A., Leyland, A., Thelwell, R., & Filby, W. (2008). Soccer penalty takers’ uniform colour and pre-penalty kick gaze affect the impressions formed of them by opposing goalkeepers. Journal of Sports Sciences, 26, 569–576.Hagemann, N., Strauss, B. & Leibing, J. (2008). When the referee sees red…. Psychological Science, 19, 769–771. Hellstrom, J. (2009). Competitive elite golf: A review of the relationships between playing results, technique and physique. Sports Medicine, 39, 723–741. Hill, R.A. & Barton, R.A. (2005). Red enhances human performance in contests. Nature, 435, 293. Hogg, M.A. & Reid, S.A. (2006). Social identity, self-categorization, and the communication of group norms. Communication Theory, 16, 7–30. Janelle, C.M. (2002). Anxiety, arousal and visual attention: A mechanistic account of performance variability. Journal of Sports Sciences, 20, 237–251. Jones, M.V., Meijen, C., McCarthy, P.J. & Sheffield, D. (2009). A theory of challenge and threat states in athletes. International Review of Sport and Exercise Psychology, 2, 161–180. Kerr, J.H., Wilson, G.V., Nakamura, I., & Sudo, Y. (2005). Emotional dynamics of soccer fans at winning and losing games. Personality and Individual Differences, 38, 1855–1866. Lavallee, D., Bruce, D. & Gorely, T. (2004). The golfer–caddie partnership: An exploratory investigation into the role of the caddie. Athletic Insight: The Online Journal of Sport Psychology, 6. Law, J., Masters, R.S.W., Bray, S.R. et al. (2003). Motor performance as a function of audience affability and metaknowledge. Journal of Sport & Exercise Psychology, 25, 484–500. MacGinty, K. (2002, 26 September). Blind fear of Ryder rookies. Irish Independent, p.19. Marchant, D. (2008). Attentional focus and golf performance. Sport and Exercise Psychology Review, 4, 16–21. Martin, L.J., Carron, A.V. & Burke, S.M. (2009). Team building interventions in sport: A meta-analysis. Sport and Exercise Psychology Review, 5, 3–16. Masters, R. & Maxwell, J. (2008).The theory of reinvestment. International Review of Sport and Exercise Psychology, 1, 160–183. Nicklaus, J. (2005). Golf my way. New York: Simon & Schuster. O’Sullivan, J. (2002, 30 September). Clarke shows his strength as he leads from the front. The Irish Times, p.4 (Sport). Syed, M. (2008, 16 July). New window on life opens for Nick Faldo. The Times, p.66. Vickers, J.N. (2007). Perception, cognition, and decision training. Champaign, IL: Human Kinetics. Wallace, H.M., Baumeister, R.F. & Vohs, K.D. (2005). Audience support and choking under pressure: A home disadvantage? Journal of Sports Sciences, 23, 429–438.